3 Quick and Easy Christmas Decoration Ideas you can create. With Christmas fast approaching, I thought I would share a few easy and quick Christmas decoration ideas I have made. Any of the 3 projects listed below are for all skill levels and would be a great weekend project to do with the kids in time for Christmas. Can you remember how to make a pom pom? I remember as a little girl making colourful pom poms using the two cut out cardboard circles technique. However, these days there are so many other ways you can use to master the perfect pom pom. The first option is how to make Christmas inspired cupcake decorations. To achieve the ‘Christmas effect’ I used Lily sugar n cream Ombre in the festive colour ‘mistletoe’and I also worked with the beautifully soft Red Heart Scrubby Smoothie yarn in the very appropriate colour ‘Christmas’. Pom Pom Christmas Cupcake Decorations. The materials you will need are: Yarn, scissors, cupcake wrappers, felted pom poms and craft glue to apply the decorations on top of the finished pompom cupcakes. Now the fun begins, it’s time to make Pom Poms…. Decide how big you want your pom pom to be before you get started. Options are: If you want to make a small pom pom I recommend using the ‘fork technique.’ Same as this finger technique but you use a fork. Otherwise wrap 2, 3, or 4 fingers using your yarn around approx. 50 plus times or until you are happy with the thickness. When you’ve wrapped the yarn around your fingers enough, and hopefully you didn’t wrap them too tight and your fingers are purple, cut the yarn. Carefully slip the yarn off your fingers. As long as you don’t keep handling it, your yarn bundle should stay together. 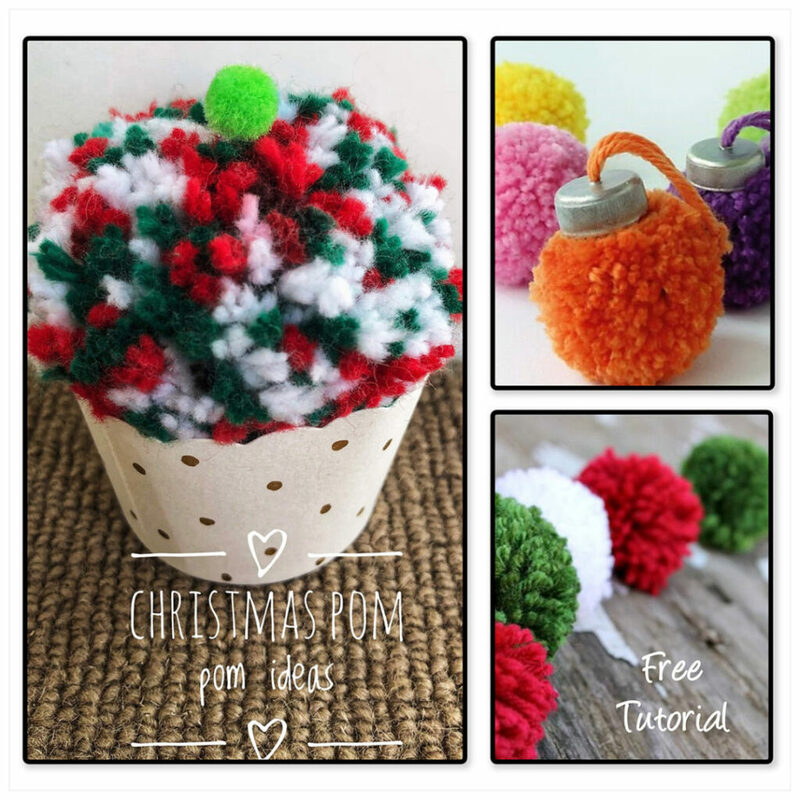 Take a separate piece of yarn and wrap it around the pom pom bundle. Tie it into a knot (don’t let it go) and wrap the yarn around the back of the pom pom tying it two more times. Tight! Fun part begins… cut open all the loops. Finish your pom pom by trimming all the yarn to the same length. If you want a fuller pom pom, you can trim it down smaller. Then once you are happy with your pom poms new hairstyle and it resembles a cupcake you simply place it into their wrappers, add some decorations like a felt pom pom on top. Or you can even use the yarn confetti you made in the process of shaping your pom poms to represent sprinkles. Well-ah you now have yourself a great little table decor for Chrissy. 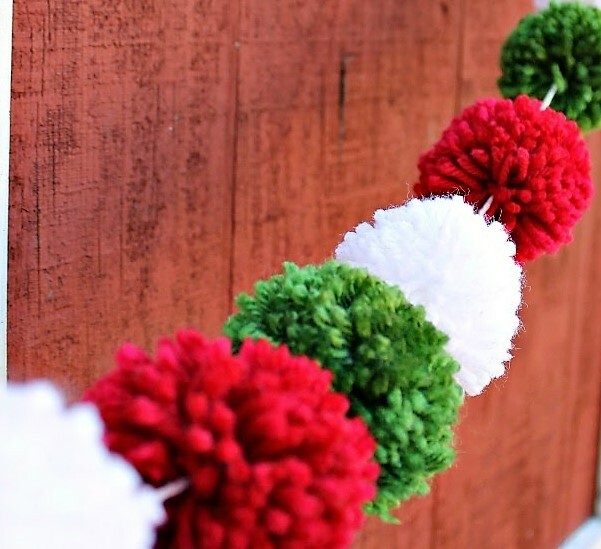 To make this Christmas Inspired pom pom garland you will need yarn, scissors, a darn needle and twine. For this project I used Caron Simply Soft yarn in the three solid colours Red, Cool Green and White. Simply make a variety of pom poms using which ever techniqueyou are most comfortable with as you will need to make a few. When you have made enough to the desirable size, it’s time to groom. Once they have all been groomed and are all similar in size,you just need to attach them together. Using a darning needlethreaded with twine, thread the pom poms onto the string one by one and you are done. For this project you will need yarn, scissors, darn needle, plastic bottle lids, acrylic silver paint and a paintbrush. I recommend using the stunning colour rage from Lily Sugar n Cream for this project due to the variety of different colour tones you can choose from. Begin the pom pom process… Once you have wrapped enough yarn around your fingers and you are happy with the thickness, tie off your pom pom. Leaving a longer piece of yarn attached (what you tie around the pom pom bundle once you remove it from your fingers)as this will be used for the ornaments loop so it can be hung. Groom your pom poms to their desired shape and size, put them aside as its now time to paint the bottle top lids using the silver acrylic paint. Be sure to paint them inside and out and then leave to dry. When the lids have dried you need to make a hole in the centre of the lids and thread the string from the pom pom through the hole. Tie the string to form a loop and the Christmas ornaments are ready to hang on the tree. Hope you enjoyed these ideas and you manage to get creative in the up and coming weeks till Christmas.